Christmas Day is just a few days away! This week marks the start of a series of holiday feasting and drinking and I'm pretty sure a lot of you have been attending Christmas parties left and right too. With our social calendars filled to the brim, where are you heading to for that most special holiday dinner date with your special someone? Paul and I usually make it a point to take time out to spend that moment alone and to enjoy a good meal to celebrate the holiday. This year has been so hectic though that we're actually flying home in a couple of days and that annual Christmas dinner date hasn't been planned yet. Eep! Luckily, we had the chance to check out Caffe B a couple of weeks ago were we were given a sneak peek of their Christmas Menus. Caffe B is a pretty restaurant and bar taking up two shop levels at The Shoppes at Marina Bay Sands. We entered through their B1 entrance which brought us to the restaurant and when you go up via a staircase inside, this will lead you to the Bar area. Both have separate menus and even the whole ambiance is really worlds apart. The restaurant has a classy, well-lit ambiance where tables were covered in white linen, seats sporting a maroon-like cushion covers and each table were situated apart from each other giving diners the chance to have their own private time. 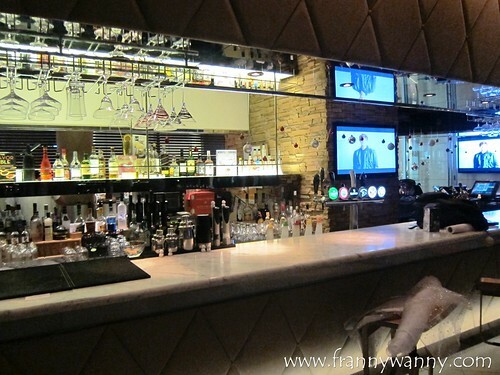 The bar, on the other hand, is definitely much more casual and dark, giving you a more chill-out vibe. 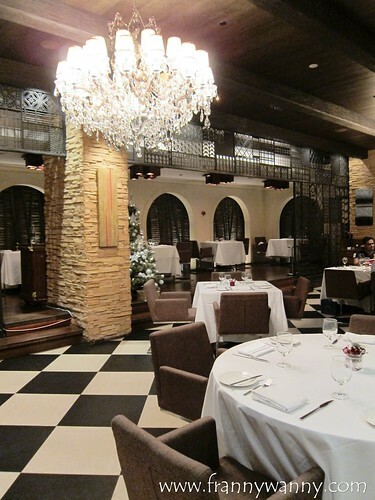 This Christmas, both the restaurant and the bar will be offering a special set menu for their patrons to enjoy. Let me share them with you! Our meal began with a plate of warm bread. 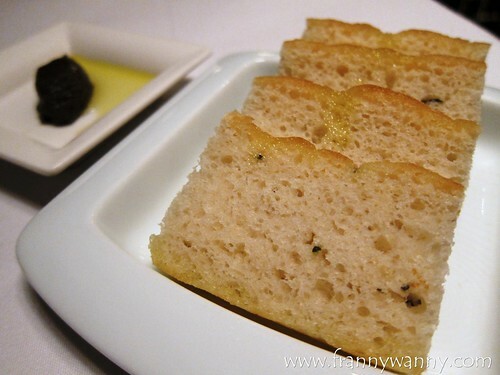 I was surprised though that they just gave us four small slices as normally restaurants would offer a basket or an entire mini loaf of freshly baked bread and butter. The bread was good, a bit crumbly though. 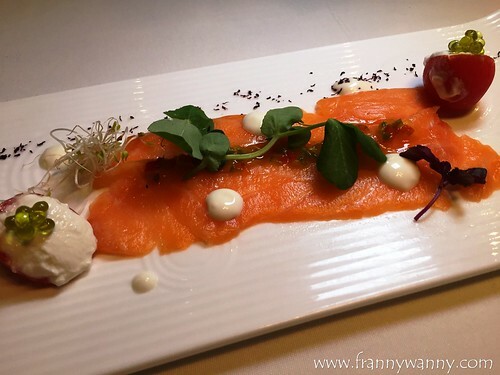 Moving on, we had the Sicilian Salmon Carpaccio. Which was a lovely plate of thinly sliced fresh Salmon with some bell pepper brunaise, sake mayo and ricota stuffed tomato. The salmon was really yummy and you all know that this is one of my favorite fishes in the world (next to boneless milkfish, gindara and cod). I love how artistic they were with the plating making it more enticing to dig in. Next was the Homemade Porcini Ravioli. I'm a bit confused how come one order will just give you one piece of ravioli. For something this good, you'll surely want more! The ravioli wrapper had a good thickness and they didn't scrimp on the chopped porcini mushroom inside. I love how I'd get that slight whiff of truffle oil upon taking a bite. Served with pumpkin cream sauce which you'll have to scrape off from the plate in order to taste. 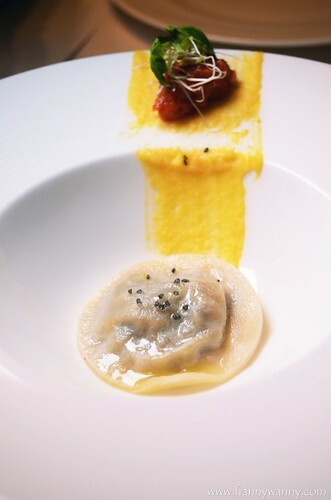 My only wish is for the chef to give us an entire plate filled of ravioli and not just one piece that we easily consumed in one quick bite. 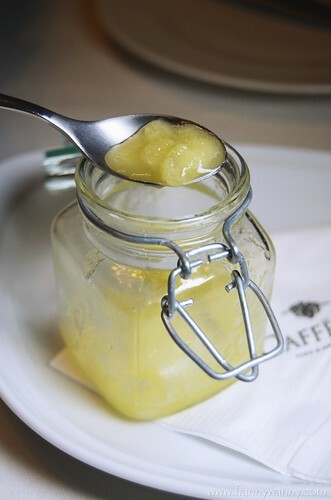 To cleanse our palate, we had the Pineapple & Lime Bacardi Sorbet. We loved the mix of sweet and tangy flavors of the pineapple however we didn't quite enjoyed the bitter aftertaste from the Bacardi. Guess, we're really not alcoholic drinkers so the taste was something new to us. It was an interesting mix though. 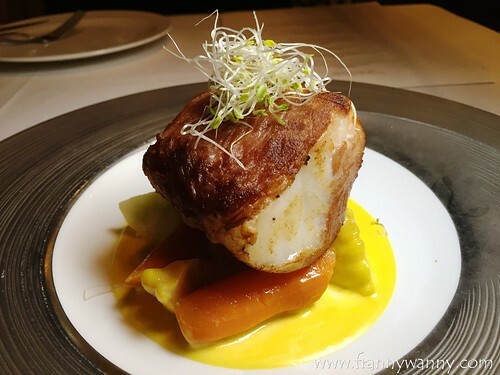 Moving on, we had the Cod in Prosciutto and Saffron. Oh my, one bite and I fell deeply in love love love. This was one of my favorites that evening and every time I think about it, I can feel my heart beating faster and my mouth watering all over again. The fish was so tender and the combination with the salty prosciutto was just perfect. Everything was amazing about this dish and I can go on and on raving about it. Moving on, we had the Festive Roasted Turkey Breast which was also a must-try. Normally, I stay away from turkey as I always find it to be too dry and bland but this one was really tender and yummy. 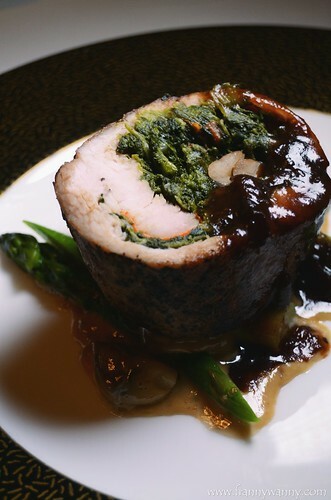 I guess it's because the turkey was stuffed with baby spinach, button mushroom and chestnut which probably made it more "moist" and flavorful inside and out. The combination is very Christmas-y (you know, chestnuts roasting on the open fire) and we love the sweet cranberry sauce too. This came in second next to the cod though which stole my heart away. 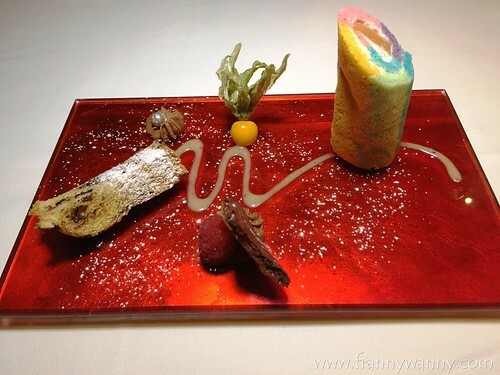 For dessert, it was a very colorful plate of Rainbow Log Cake which was a trio of all the traditional Christmas sweets normally enjoyed here in Singapore. First, there's the signature log cake presented in a rainbow of colors, followed by a piece of panettone which reminds me so much of a biscotti but this one has a spongy texture and it's filled with what I suspect are berries. It's the Italian's take of the very European and Pinoy fruitcake. There's also a piece of chocolate which was yummy! It was a very filling dinner but, wait! There's a lot more..
After enjoying the first Christmas menu, we moved on to the second menu. This can be enjoyed at the bar area of Caffe B. While many might think that bar only serves finger food (also known as bar bites) and pizza, this menu will prove them wrong. Our second dinner began with an interesting plate of...Escagot a la Romana. Eep! I don't normally eat snails but because I love you all so much and in the spirit of Christmas, I did to be able to tell you what I thought about it. Well, it wasn't so bad. Paul loved it actually and while I think it might take a while for me to get used to eating this, I have to say that my experience was quite pleasant. 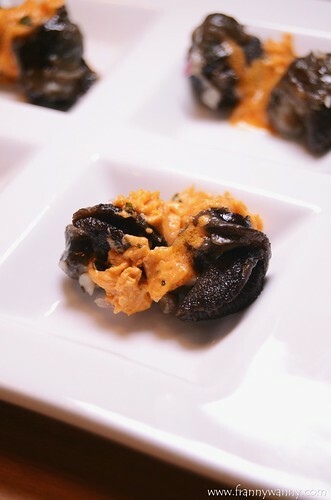 The snails were cooked in red wine and Italian herbed butter making it a savory treat. It's served with bread which I recommend for you to use to mop up that extra butter sauce on the plate. 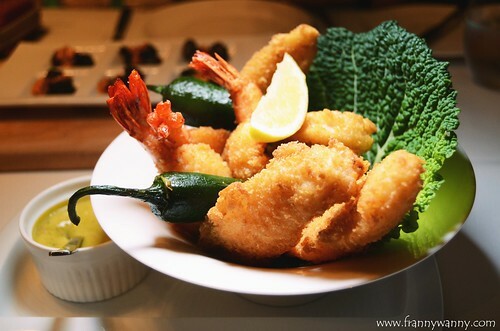 Italian Fritto Misto -- a hearty platter of deep-fried seafood such as tempura prawns, fish and calamari. It comes with a yummy pesto cream sauce. This is perfect for family dining with young kids who'll surely love these fried treats or for those who just loves their seafood very much. I liked the prawns and the calamari the most actually but I have to admit that the oily taste got to me after a while. 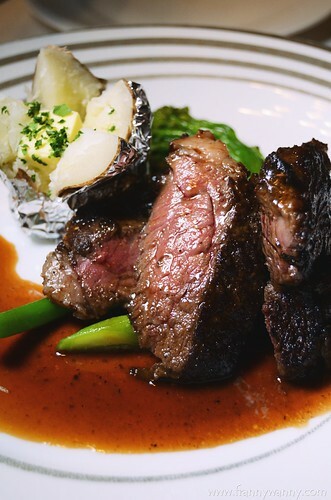 Roasted Rib-eye -- Oh my, this one was a winner! Remember how I felt about the Cod in Prosciutto and Saffron earlier? Paul had exactly the same "I think I'm in love" moment with this dish from the moment he had his first bite. Well, I don't blame him. The meat was definitely fork tender and it's not just any roasted meat, mind you. It was a flavorful rib-eye which was marinated with herbs, cajun and dijon mustard. I'm sure the chef marinated this for a long time as you can really taste the flavor through and through. If I were to choose between the two mains, this one would definitely get my vote. At this point, we could hardly take another bite but as soon as we saw the Black Forest Surprise, we both knew that we shouldn't skip this. A yummy and beautiful creation of Caffe B's take on the classic Black Forest Cake. 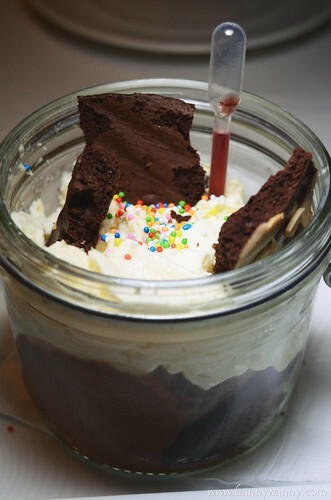 Served in a glass jar, it's a combination of Triple Chocolate Ice Cream, Mascarapone cream and rainbow sprinkles. To give it more drama, you have to squeeze out the raspberry syrup out from the "syringe" before digging in. The texture reminds me of a tiramisu minus the coffee flavor of course. This is perfect for all chocolate lovers out there and it's really a good way to end a nice meal at Caffe B. Both menus are sure to make your Christmas merrier than it already is. Book a table now as the Christmas menu is available till 25 December 2015 (Friday) only. Hurry! 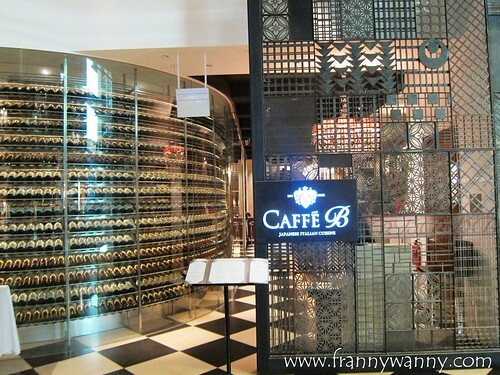 Caffe B is located at 2 Bayfront Avenue, The Shoppes at Marina Bay Sands, #B1-15/#01-83 Singapore. Click here to make a reservation.